PTCL is very generous in offering special promotions and packages to its existing and new customers these days. Now PTCL has launched another awesome offer of free broadband upgrade from 1Mbps to 2Mbps for new and all existing customers. This is an Opt-in offer; customers must order to activate this offer. You can enjoy unlimited download at 2Mbps internet speed at the price of 1Mbps i.e. Rs.1250 per month. You can enjoy these rates till January 01, 2013. After this, normal charges of 2Mbps will be charged. Normal charges for this package are Rs. 1499/month. 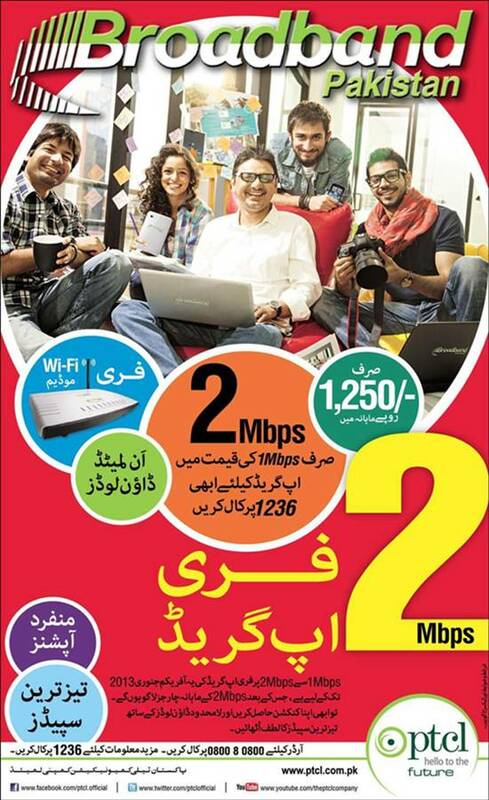 You will also get Free Wi-Fi Modem on availing this offer. You can connect your laptop or smartphone via Wi-Fi Modem to share your DSL connection or you can also connect it with multiple desktop computers within the range of Wi-Fi signals. PTCL's WiFi connection is secure and password protected to avoid any misuse. Existing customers may call at 080080800 or 1236 from your PTCL land line telephone to order or for further information. New customers can avail this promotional offer at the time of subscription or by calling later on above numbers.